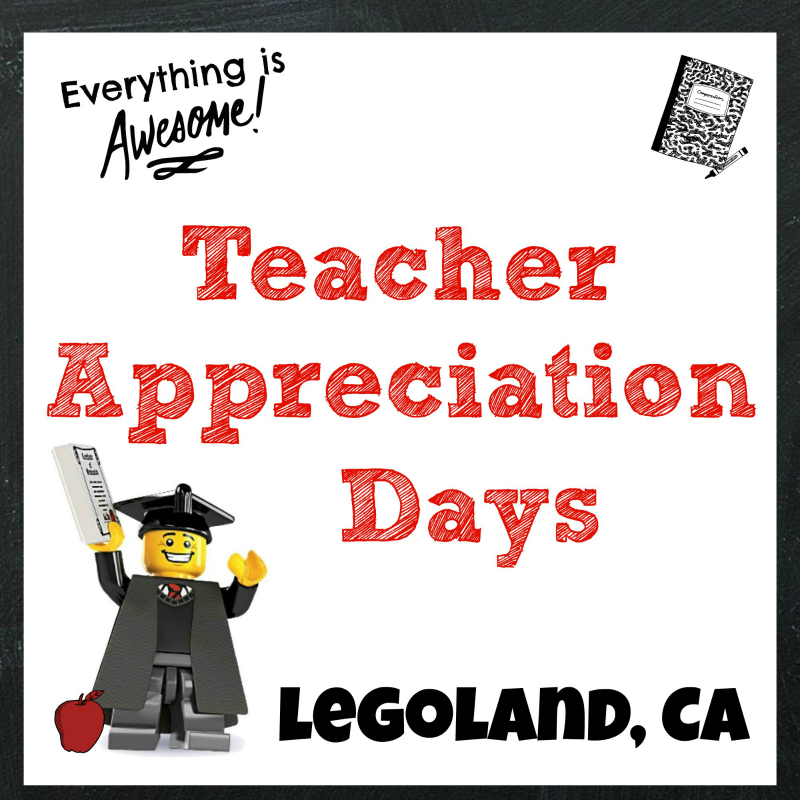 If you’re planning on visiting the West Coast, a great Southern California staycation destination is the Great Wolf Lodge in Garden Grove. With plenty of family fun to entertain the entire family, the Great Wolf Lodge is the first and only indoor water park in SoCal with 105,000 square feet of splashable fun, exclusive to resort guests with 14 water slides, a 476 foot long lazy river, a wave pool, water playground, obstacle challenge, kiddie pool and a surf simulator. 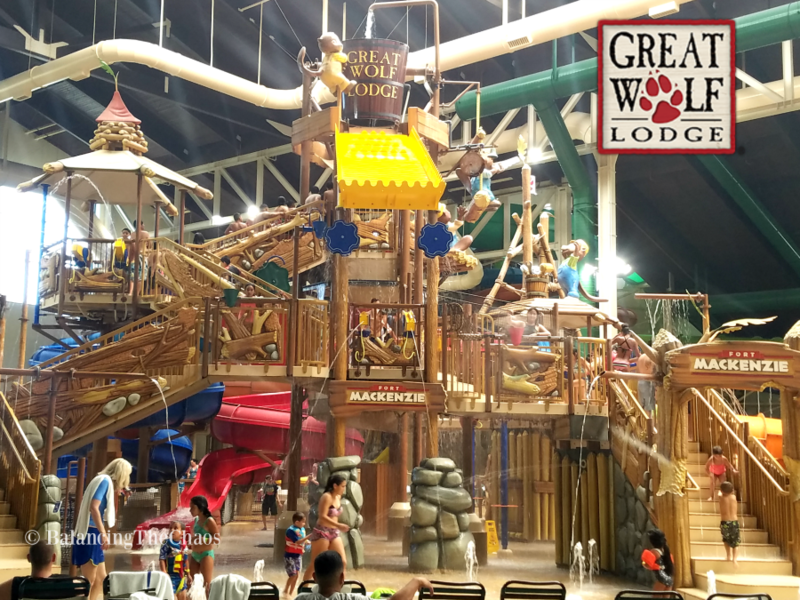 Last week we were invited to Great Wolf Lodge for a special Media Day to experience some of the fun this amazing Southern California destination resort has to offer. With over 600 rooms, an indoor water park and numerous exciting things to do, plan to spend a couple of days at the lodge in order to fit it all in! Grand Bear Suite – The largest suite offered, sleeps up to 8 guests. The Grand Bear Suite features a private master bedroom with a king bed and a full bathroom. The main area includes two queen beds, a full sofa sleeper and second bathroom. Grizzly Bear Suite – Sleeps up to 8 guests. The Grizzly Bear Suite features two private bedrooms; a master room and a second bedroom with two queen beds. There is also a sleeper sofa and a second bathroom. Great Bear King Suite – This accessible premium suite sleeps up to 6 guests with two queen beds and a king sized master. KidCabin® Suite – Sleeps up to 7. 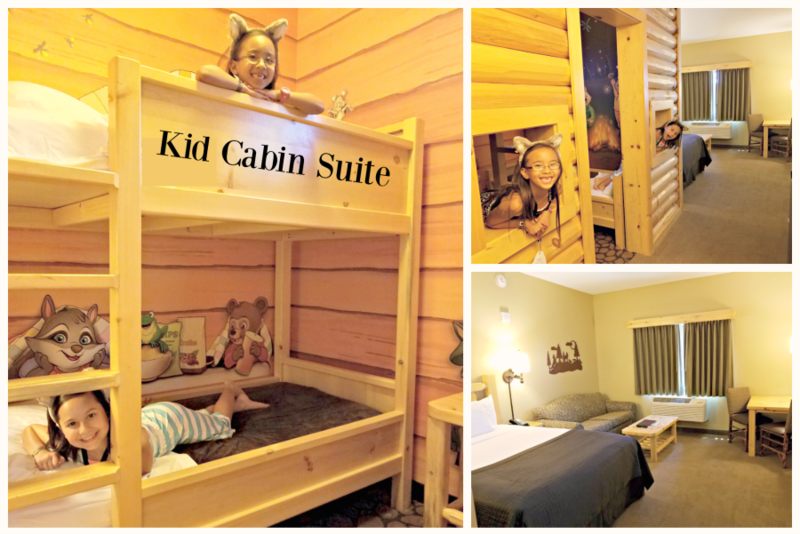 The KidCabin suite features a queen bed, sleeper sofa and a Great Wolf Kids-themed KidCabin with bunk beds and a twin bed. 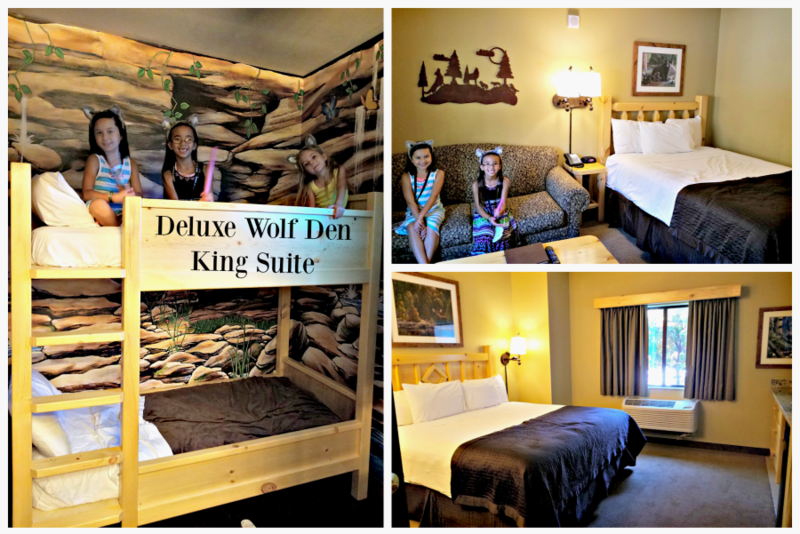 Wolf Den Suite®: A fun family suite that sleeps up to 6 with a queen bed, sleeper sofa and a themed “Wolf Den” cabin with a set of bunk beds. Double Queen Suite: Sleeps a family of four with two queen beds. Family Suite: The basic of rooms, sleeps up to 6 with two queen beds and a full sleeper sofa. 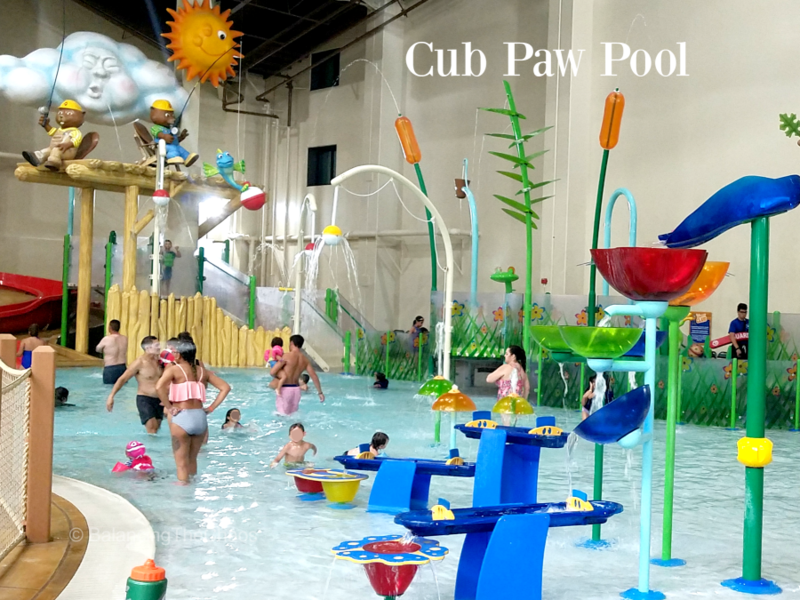 The Great Wolf Lodge is known for their Indoor Water Parks, and the Southern California location features 105,000 square feet of splashing fun that is only exclusive to resort guests. 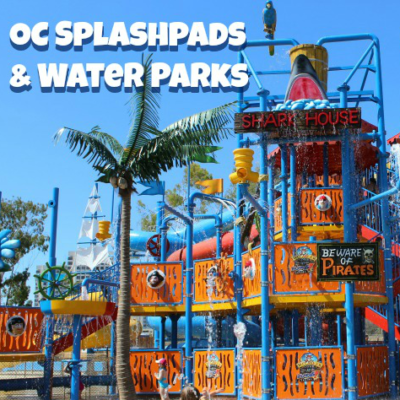 Families can spend an entire day, and then some in the waterpark with 14 water slides, a 476 foot long lazy river, a wave pool, water playground, obstacle challenge, kiddie pool and a surf simulator. With water conservation being a hot topic in Southern California, naturally water conservation is a concern, especially with a water park. This indoor water playground takes roughly 565,000 gallons of water, less than one Olympic sized swimming pool. 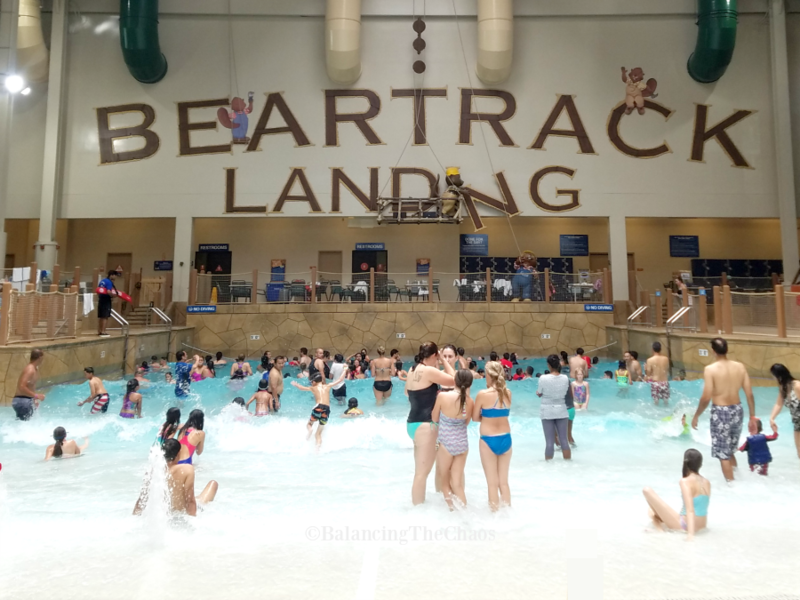 The Great Wolf Lodge water park uses a system that is one of the most advanced in the world, enabling recovery and recirculation of most of the water used in the park. One of the questions posed to park experts was if there is an “accident” in the pool. We were told it takes roughly 30 minutes+ for the water to recirculate and go through the sanitization and filtration process. To prevent excess water loss through evaporation, the humidity and temperature in the park is controlled as well. You can also venture outside for another 2,000 square feet of additional water park fun with a small water playground and open pool area for simply splashing around. There are many cabanas located around the outside area of the water park to relax, have lunch and enjoy the sunshine for an additional fee. The Great Wolf lodge also has a variety of restaurants from a full service to a quick dinner on the go. The Executive Chef, Hany Ali, shared with us their dining philosophy: fresh, organic, options everyone will love. If someone in your party has a food allergy, it’s not a problem – the family will be assigned a personal chef who will be on hand to personally create an allergy free menu. 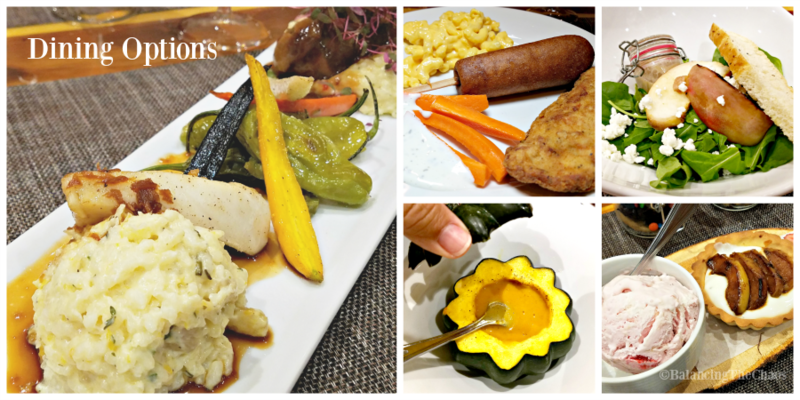 Lodge Wood Fired Grill® – A full service restaurant opened for lunch and dinner. Hungry as a Wolf® – Family meals on the go for lunch and dinner featuring fresh made pizza, sandwiches, salads and pasta. Bear Paw Sweets & Eats™ – Ice cream, baked sweets like fudge, cupcakes and more. Dunkin’ Donuts® – Perfect for breakfast, America’s favorite all-day stop for coffee and baked goods. Great Wolf Lodge has taken parents into consideration with the brand new “Wine Down Service”. A new option, that is debuting in Southern California this summer gives parents a chance to have their own time. Once the kids go to bed, parents can indulge on signature wines, cheese and dessert pairing that can be delivered straight to their rooms. Some of the pairings include “Kids Snoring, More Pinot-Noir-ing” that comes with decadent chocolate truffles and a velvety Pinot Noir and the “Rekindle the Bonfire” which includes luscious dark chocolate covered strawberries with a bottle of Chloe Prosecco. Story Time – Gather in the Grand Lobby nightly to hear stories about the Great Wolf Kids characters just before bedtime. Wolf Walk™ – Learn about the many animals and wildlife living in the Northwoods, and make an origami wolf to take home. 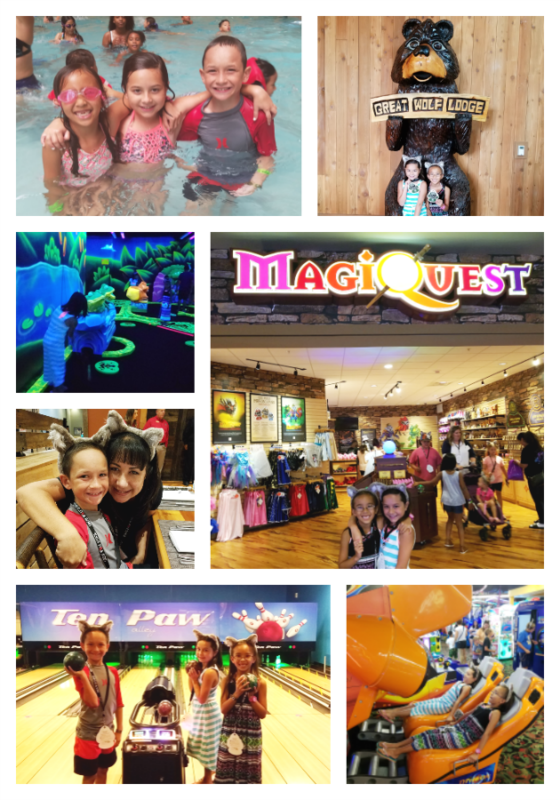 MagiQuest® – An awesome interactive attraction, create your own magical wand and participate in battles with dragons, befriend a pixie and wave a magic wand in this live-action adventure game throughout the resort. The games features three unique chapters, each with their own challenges and quests (additional fee). The Great Wolf Kids® Program – Daily activities for kids that take place around the resort, including dance parties, face painting and games such as Wiley bingo, character floor memory and character trivia. Howly Wood® XD Theater – This motion thrill ride transports riders directly into the movie action with every effect amplified creating an unforgettable experience (additional fee). Northern Lights™ Arcade – Let the gaming begin with more than 100 interactive video and redemption games that allow guests to redeem points for prizes (additional fee). Howl at the Moon™ Mini Golf – A glo in the dark 9-hole themed indoor miniature golf course (additional fee). Scooops® Kid Spa – A spa created just for kids complete with ice cream-themed manicures, pedicures and more (additional fee). Ten Paw Alley™ – A miniature family-style bowling. Clubhouse Crew – Interactive scavenger hunt through the resort starring the Great Wolf Kids characters. Perfect experience for the resort’s youngest guests. 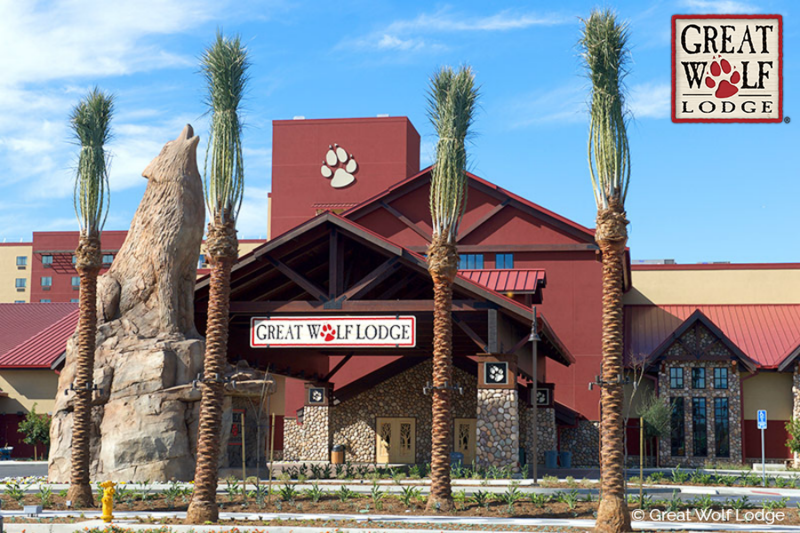 If you live locally and want to check out Great Wolf Lodge, you can do that too. Main Street (the downstairs lobby) is available to hotel guests and local residents. However the water park is only available to hotel guests. If you know of a family staying at the hotel, additional water park wrist band can be purchased for $50 per person. Interested in trying out this amazing family vacation destination yourself? Rates for family suites are available start around $259.99 per night. For more information or to make a reservation, visit www.greatwolf.com. And, keep an eye out for more changes to the Southern California location including the Great Wolf Lodge Candy Company coming soon. Thank you so much to our friends from Great Wolf Lodge for treating our family to a day of play. We’ll certainly be back! What an awesome place. I wish we had something like this where I live.